We are just about 2 years into ownership of Rocinante our Norseman 447. In that time we’ve sailed her just about 8,000 nm and we’ve gotten to know her a bit better. She’s a lot different than our previous boats, but still considered a classic… one of Bob Perry’s best designs. She sails and handles wonderfully in all conditions we’ve experienced so far. The following is a list of features that are either part of Bob’s design or came with the boat when we purchased her… things we didn’t have or know of before owning this fine vessel, but things we have come to love. In the next post I’ll write about a few things we’ve added to Rocinante that we felt were worthwhile. Don’t forget to add to the conversation with your own favorites in the comments. But here we go… 6 things we love about Rocinante. We prefer our lines left at the mast rather than led to the cockpit. I have discussed why in greater detail here. But the way I like to think of it is… if lines at the mast are the chocolate, then the granny bars are the peanut butter. And in my opinion, you really shouldn’t have one without the other. They just work so well together. Once you make the effort to get to the mast, let’s make sure you stay there, and get the job done safely and efficiently. Granny Bars help you do that. But they need to be stout. On our Norseman 447, we’ve got a three legged 2” OD granny bar with a slight curve to hold you in tight even when the bucking bronco gets-a-buckin’. We lean on them, we stand on them, and we secure our tethers to them. My thoughts…take the money you would spend on leading lines aft and put it towards granny bars. Funnily enough, my two previous boats didn’t have mainsheet travelers. Both were Lyle Hess designs, based on a more traditional lines and systems. They were definitely nothing like this Bob Perry performance-cruiser. So mains’l travelers, although familiar were never something I owned, and most of my previous interactions with them reminded me of something called spaghetti. Lots of line… “You pull, I’ll ease” is how it usually goes I think. But not with our continuous line traveler that leaves our cockpit clean and free of extra line piles. I love this idea. A two-way winch with a locking position in the middle makes tending and adjusting the traveller a simple, clean operation for one… even a tired one. This design allows you to easily winch the traveler to windward if necessary. A major bonus. This terminology I saw in the Yachtworld listing, but couldn’t wrap my head around. “Accessible”? Are they kidding me? What could be more accessible than external mounted chainplates like the BCC or the Nor’sea? This Norseman has internal chainplates, that run right through the deck. What the dickens are these people taking about? Well it took me a little while to fully understand the “accessibility” of these chainplates. While they are hidden behind some paneling inside the salon lockers… they are at the same time accessible. What that means is that you don’t have to grind out fiberglass to get to them! 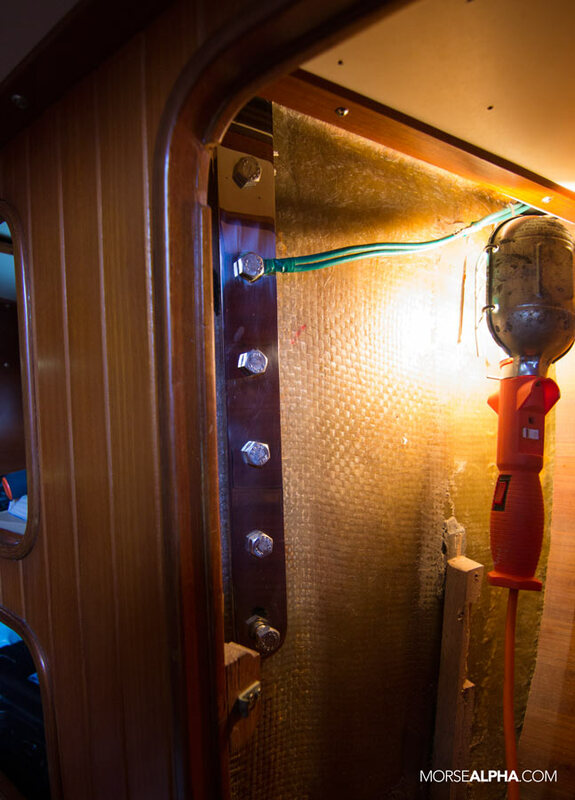 Yikes, I had no idea that some boats actually glassed in the chainplates… sandwiched between layers of cloth and resin… where any water intrusion will surely corrode them! Many other Taiwanese boats suffer from this problem… I know of a few like the Kelly Peterson, and the Hans Christian knock offs… like Young Sun (edit: comment below revealed many more Taiwanese boats suffered including Hans Christian, Tayana, and CT). I’m sure there are more… It was a crazy boat building frenzy in Taiwan during the 80’s. This is a pretty rad Bobby P. design idea. Fold up a seat back, hang some support bars from the ceiling and voila you’ve got a bunk bed. Yes, it makes accessing the lockers behind a bit more challenging, but the benefits far outweigh the annoyances. This bunk bed without the mattress (backrest) make for an awesome work bench when it’s project time. It’s a place to put the epoxy, the tools, mix paint, rebuild pumps, set up jigs, etc, etc, etc. But back to the bunk part… it’s Teresa’s favorite place to sleep! I think it reminds her of being a little kid again. We use it anchor often. 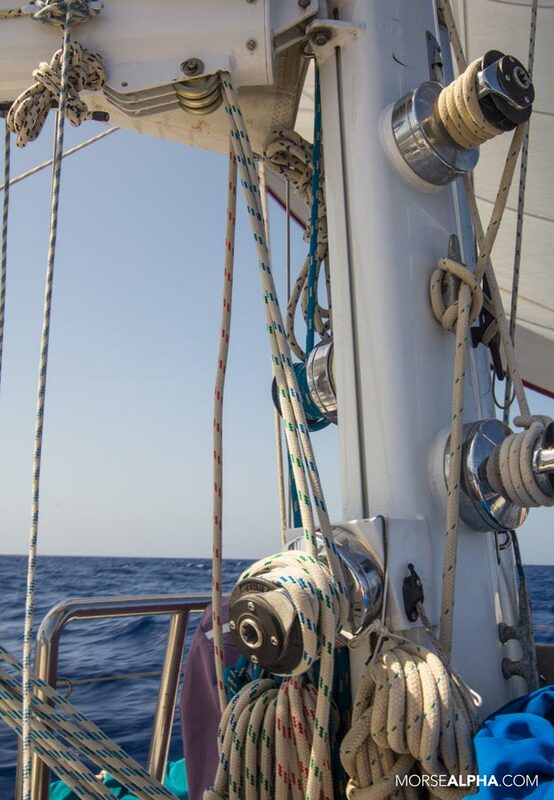 It requires a lee cloth underway on a starboard tack, and the bars help you feel secure too. This has always been an important feature of a boat for me. I think it’s because of all the time I spent sailing on schooners that had lots of flat deck space to walk about, line up and pull on lines. I wrote about it here with regards to the BCC. You can’t beat a low flat stable platform for working. While the Norseman 447 is considered a flush deck boat, it does have a small raised section to be stepped over, but not up onto like a cabin house. If you work the mast from deck level, than for me that counts as flush deck. And once that dinghy is off the foredeck… wow it’s big up there, and pretty flat… flat enough for some yoga at least. A good reefing system is paramount. Keep it simple and make it easy. We teach so many students how easy it can be to reef. How often we see boats totally overpowered and the helmsman struggling to keep control of his vessel. Even I have been guilty of not knowing I should have reefed. In my very early days of sailing, I borrowed a friends Catalina 22 and sailed my girlfriend of the time to a nearby anchorage for a seemingly romantic sailing adventure. The wind was a steady 15, gusting to 20. I didn’t know why it was so hard to steer and I thought I was going to break that little tiller. Thinking back on it now, I’m not even sure the sail had any reef points! But it didn’t matter I would have had no idea how to use them anyway! Maybe I was the fool and not the superstar I thought I was! But back to our current set up. I never knew how sweet a winch on the back of mast could be. Elizabeth had her reef outhaul winch on the boom. Not a bad place, but sometimes I’d find myself leaning precariously over the side to tuck a reef, or worse yet, on the leeward side, drowning under a pile of sail as I tried to tug on that outhaul. Now, moving that winch to the mast amidships eliminates all those issues and we like that! 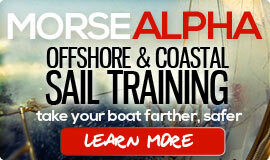 You can join us aboard Rocinante for a Morse Alpha Expedition… coastal or offshore sail training. We specialize in patience, communication, couples sailing, traditional navigation and maximizing fun while minimizing stress. We’ve been teaching people to sail for two decades. We are both USCG licensed captains with over 30 years of combined sail-training experience. 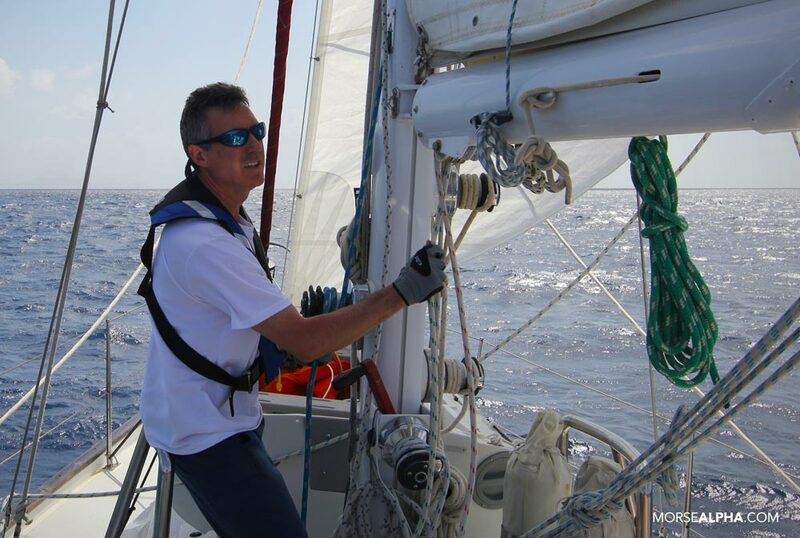 We help people sail farther, safer and with more confidence. Our schedule can be found at MorseAlpha.com. Fair winds & a following sea. Good to know about the HCs, Tayanas and CTs … didn’t realize it was so prevalent! Those are some good points and a lot of these features you talk about make it safer and easier to get the job done to further enjoy your sailing. You are correct and there were a ton of Taiwanese boats built back in the day. Some had stainless steel issues, others electrical, welding problems, or the use of steel fuel tanks, but overall these boats have a ton of miles on them and for the owners that own them most have corrected those issues. These boats are good heavy blue water cruising boats that can probably take more punishment than the crew and they’ll still keep going as long as they are maintained well. As for chainplates some manufactures probably did glass them in, which makes no sense at all, but on our Tayana they are not glassed in and are very easily accessible for rebedding or replacement. Great article and I enjoy following your writings. My current boat (since 2000) is a Bob Perry Nordic 40 and I agree completely about the quality of his designs. 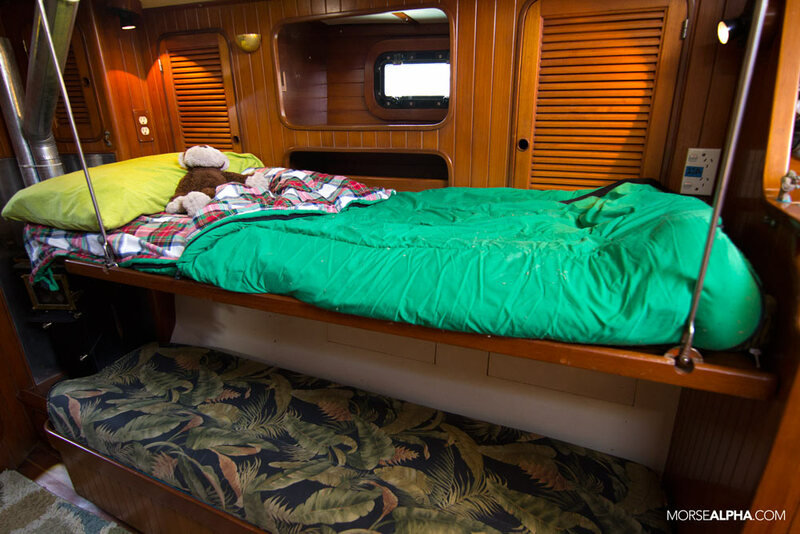 One small disagreement – my boat also came with the back rests that turn into bunk beds. They are great for a Bermuda Race where you have a bunch of crew. But for regular cruising, easy access to the spacious lockers behind the backrest trumps the bunks. I removed them and am am glad I did – we probably go into those lockers a dozen times a day. Keep up the great sailing and writing! Hmmm…I actually disagree with Ben’s comment about locker access. We haven’t had any trouble with the bunk bed getting in the way of locker access. Maybe its a different design? Or – maybe we just have so much empty locker space (because we keep room for 5 students and all their gear) that we never need to get into those lockers! If it works better for you with them removed – then go for it! I could see how that might be an advantage. 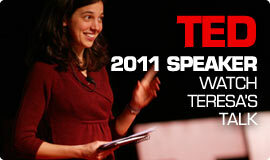 Hey Max – good to find you here and agree, Teresa does a great job with stories of the sailing life. Sailing San Francisco Bay still fun but the ocean is always beckoning. Agreed! A 32 ft boat is awesome for a full time couple with occasional guests. 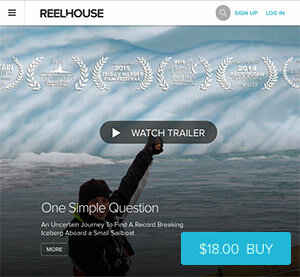 We needed 44ft because we take students aboard – thats the only reason we went bigger. Ben’s Bristol Channel Cutter 28 had space on deck even with the hard dinghy. My Nor’sea 27 ….well, I had an inflatable kayak! 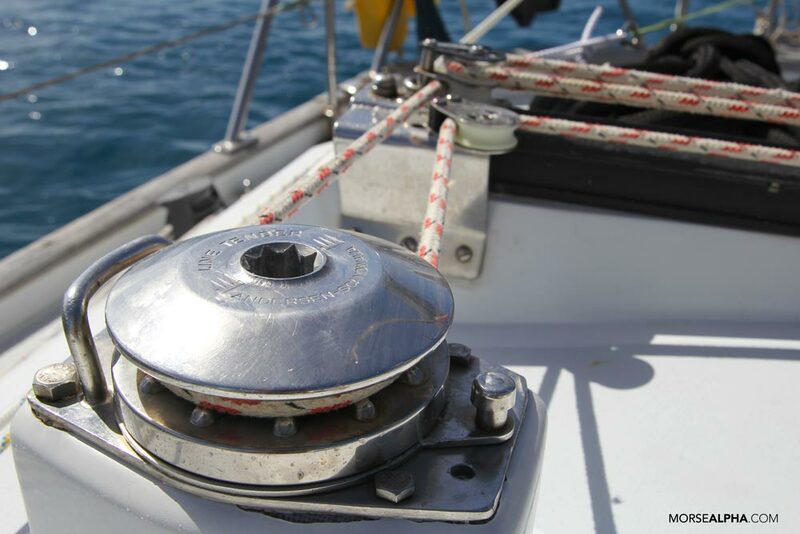 The mast mounted winch for reefing is a great feature. What do you think about a single line reefing system? I’m considering putting together such a system on my boat. Benji had it on his first boat and thought it was the worst system ever. It never produced a great reef. And it was cumbersome because there is too much friction in the system because of all the turns. We don’t understand how it would be ideal – you have to pull two things in two separate directions (the tack and the clew) – all with one line. 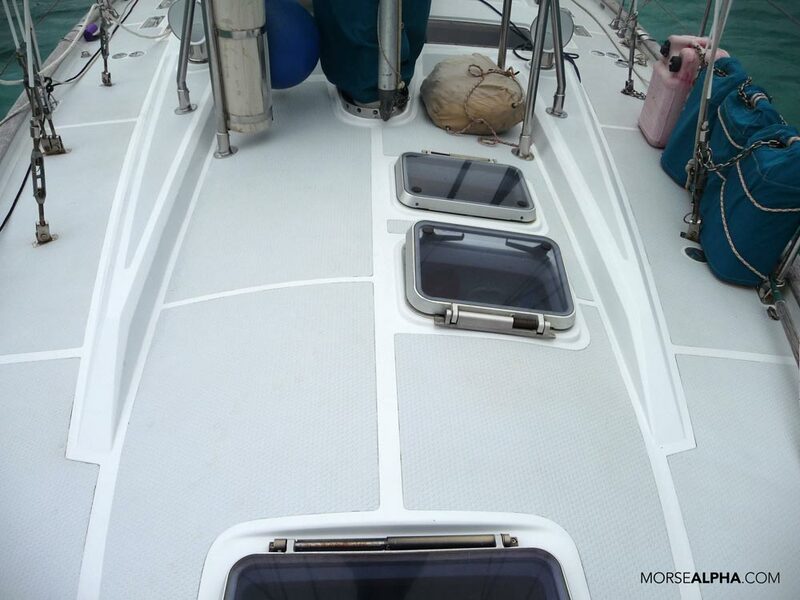 I’ve tried it on other boats and never had as much success as the reefing system we currently have. I suppose it is possible. I would like to try it again because it has been a long time since I’ve really checked it out. If you do decide to do single line reefing – let me know how it works out! I’m relatively new to reading your blog, and I must say how much enjoyment I get from it. Great stories and advice and fun relaxed videos. Land locked at the moment and we’re looking at selling our house later this year and moving aboard, so checking in with you guys keeps me inspired to cast off and follow your lead. Keep up the great work guys. All the best.